Rick and Morty Beach Towel: "Keep Summer Safe" Spaceship | Nerd Much? It’s time to kick off the summer! Whether you will be spending your time at the beach, lounging in the pool, or just inside catching up on your favorite episodes of Rick & Morty, this is the spaceship towel for you. Are you still reeling over the latest announcement of Rick & Morty being extended for another 70 episodes? Well, now is the time to start snagging up all the great Rick and Morty merch before everyone else does, like this awesome Rick and Morty beach towel. Even if you won’t be spending all your time in the water this summer, who doesn’t need a quirky towel like this? With a black background this towel features your favorite cranky mad scientist and nerdy nervous sidekick in vibrant colors. The designers were even able to capture Rick’s fretful expression as well as Morty’s inebriated nonchalance. Made of 100% cotton this towel is conveniently machine washable, just be sure to tumble dry on low heat. Measuring approximately 70cm by 140 cm it is perfect to carry on your next portal jumping adventure. Upgrade your linen closet or beach bag today, at the great price of just $24.99, these are sure to disappear faster than Rick and Morty through a space portal. This “Keep Summer Safe” spaceship towel is currently available for preorder from Merchoid but they’re disappearing fast (a lot of the merch from Merchoid typically does). 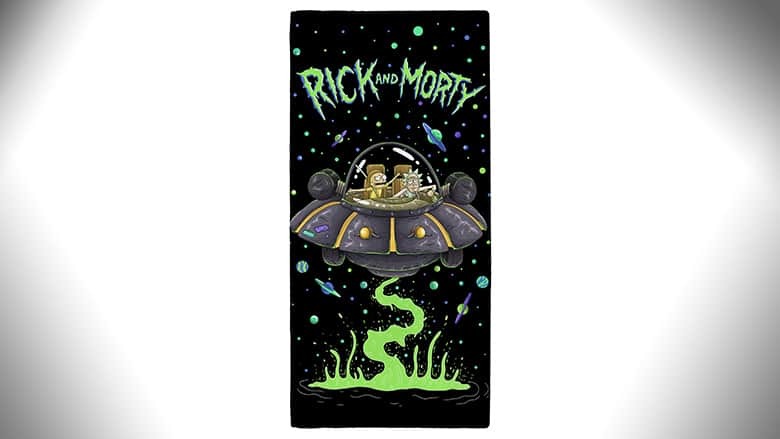 So if you’re looking for an awesome Rick and Morty beach towel, you should probably preorder yours before you have to go to an alternate universe to do so. These awesome Rick and Morty towels are expected to ship July 2018 (date subject to change due to factory delays). So go ahead and kick back and relax on this awesome Star Wars Millennium Falcon Pool Float while you wait for your awesome Rick and Morty Spaceship towel to arrive in the mail.